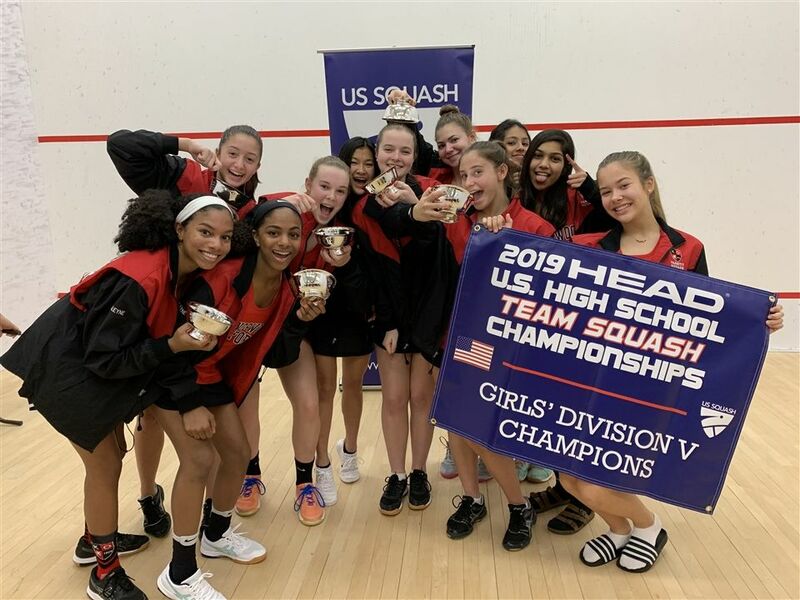 After winning the Division V title at the 2019 U.S. High School Team Squash Championships on Sunday, the Kingswood Oxford varsity girls squash team are the Wyverns of the Week. Kingswood Oxford defeated Nardin Academy, Squash Smarts Varsity, Moses Brown School and Buffalo Seminary to win the title at the prestigious event. Kingswood Oxford entered the tournament looking to make a run and posted three impressive victories after a Round of 16 forfeit. "We were ranked in the top four of the division, so we knew we had a really good chance coming in," Kingswood Oxford coach Cameron Biondi said. "With that said, I think we were happy to play so well and have convincing wins for each team match." Despite coming into the event highly ranked, there were some nerves for the team but they settled in and played excellent squash. Ananya Alleyne '19, Cami Berckemeyer '19, Izzy Berckemeyer '21, and Amelia Levine '20 all went 3-0 for the tournament. In the final, Kingswood Oxford faced Buffalo Seminary and posted a 5-2 victory. "The championship match is always a lot for a player's nerves, but our players pulled through the pressure to carry their team to the Division 5 title," coach Biondi said. Ananya Alleyne '19, Izzy Berckemeyer '21, Amelia Levine '20, Ely Alleyne '23 and Cami Berckemeyer '19 all came away with victories against Buffalo Seminary to clinch the title. Pre match traditions/superstitions: We say “Every inch counts” and #goals before each match. We put our left hand in for the cheer. At Nationals, before each match, we sat in a circle, closed our eyes l, and one person would talk through a match, so everyone could visualize it. Goals for the rest of the season: Our goals for the rest of the season are to keep winning and place at New England’s.